"I love to smile now because my teeth look great!" It can cover and support a tooth with a large filling when there isn't enough tooth left. It can be used to attach a bridge, protect a weak tooth from breaking or restore one that's already broken. 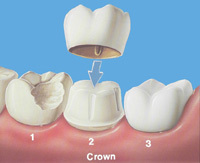 A crown is a good way to cover teeth that are discolored or badly shaped. It's also used to cover a dental implant. If Dr. Melissa recommends a crown, it's probably to correct one of these conditions. Our primary concern, like yours, is helping you keep your teeth healthy and your smile bright - literally, your crowning glory. A bridge is an artificial tooth used to replace one that is missing. It is attached to your neighboring teeth. 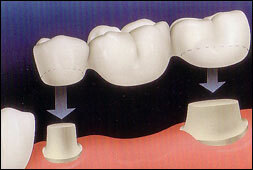 One of the benefits of using a bridge to replace a missing tooth (or teeth) is how natural it looks and feels. With proper care, bridges can last for years. See us today if you would like to "bridge the gap" in your smile! Snap-On Smile is an affordable, non-invasive and completely reversible, cosmetic removable arch that can easily and painlessly give you a beautiful smile. No shots. No drilling. Ask us today if this is a good option for you. All of Dr. Jarrell's restorations are made in the USA. We even have several labs in Kokomo we use to keep our business local. And, we only use the finest materials available in dentistry.